← PLEASE SPARE A THOUGHT FOR THE HOMELESS AT CHRISTMAS! WHAT IS THE WEST DOING ‘PALING’ UP TO THE SAUDIS? 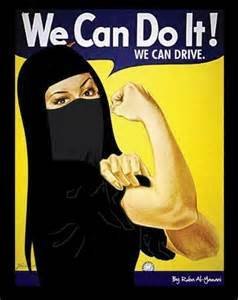 Two Saudi women detained for nearly a month after defying a ban on women driving were recently referred to a court established to try terrorism cases! Apparently the two women involved are not being tried at the Specialised Criminal Court in Riyadh for driving, but for voicing certain opinions online. Yeah, right! As in most Arab countries, women can cook and give birth, but that’s it! So how are the Saudis any different to ISIS, or any other Islamist terrorist group wishing to install Sharia Law into a land? Let’s not kid ourselves, why if it wasn’t for oil, the West would have withdrawn their support for Saudi Arabia decades ago, and by now the that particular monarchy would be in the hands of its enemies! The again, who would the West sell arms too, arms the Saudis only ever use for show! Many years ago I read an unconfirmed report, that during the Potsdam Conference, in Berlin, 1945, at which the victorious, allied world leaders decided the fates of Germany and most of Eastern Europe, someone suggested turning the exhausted Allied armies around and sending them back to the Middle east in order to take control of every single oil well. It is doubtful this off the cuff suggestion was ever recorded in the minutes of the numerous Potsdam meetings. Hindsight, considered the perfect science, perhaps the suggestion should have been acted upon? The Western World might have enjoyed permanently low oil prices, and probably not suffered from acts or terrorism, which has often been funded by the same individuals the West buys oil from! Anyway, without access to a time machine, no one will ever know!